Heads up – scammers are getting more and more tricky! One of our team received this email from “Microsoft”. 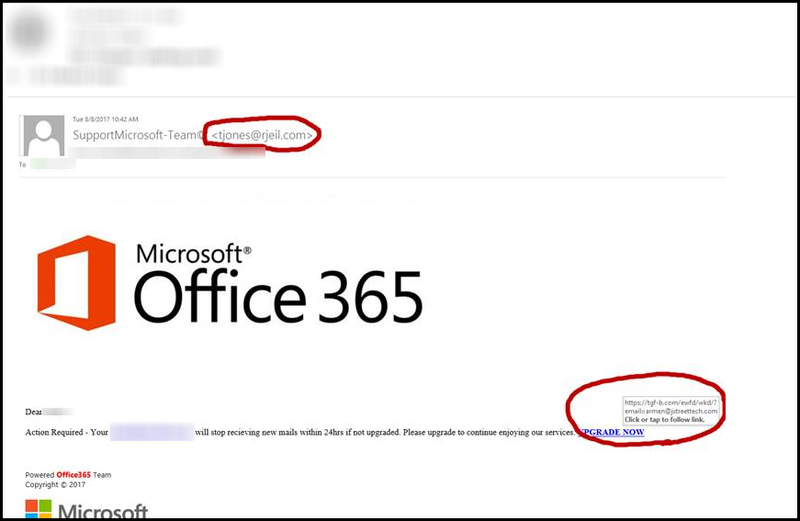 Notice that the email address from “SupportMicrosoft-Team” is not actually a Microsoft email address. Notice that this official-looking email says that this user will stop receiving new emails within 24 hours if the account is not up graded. Notice that the UPGRADE NOW link (viewed when hovering on the link but NOT clicking on the link) links to a page that is NOT part of Microsoft’s domain. As scammers become more and more clever, you should use diligence before clicking on any links – even if the email LOOKS legitimate! ALWAYS review the email address that the email was sent FROM. Don’t just ASSUME that the From NAME is legitimate. ALWAYS use your “skeptical glasses” when text in an email says that your account will be terminated, suspended, or any other language that threatens that your account will be interrupted. ALWAYS review links (by hovering over the hyperlink text to see the real hyperlink address) before clicking on said link. Contact the corporation. Many large corporations have a team that work to hunt down these scammers. « J Street Buzz – Why Do Many IT Folks Hate Access?